How are the skins performing with so many uses in one day? Some skins working better than others? Skiing day was better than Japan in that the pitches are steeper and can really let the skis go, hopefully this link will work to a video which pretty well sums up the conditions. Today three climbs just over 1200m total. 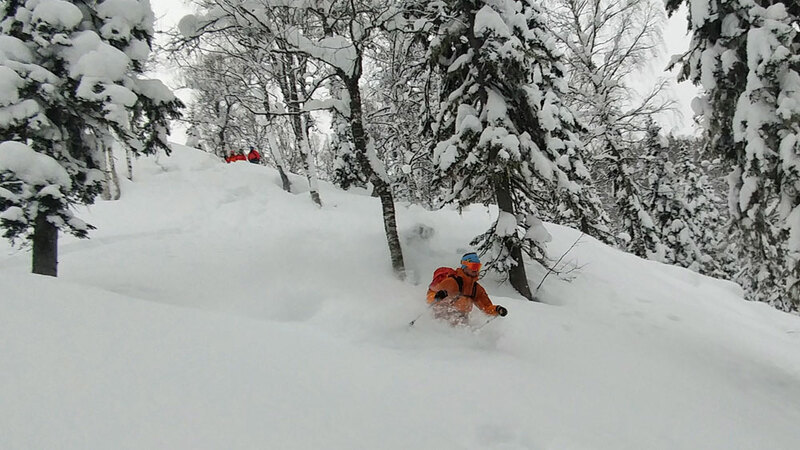 However, there's a lifetime's worth of powder filled slopes between 35-45 degrees - both alpine and tree - on Hokkaido with greater than 400m vertical descent accessible by touring. Honshu has enough for a cat's lifetime. Today climbed 700m to a peak and the guide earned his money today as he was breaking track in insane depths of fresh snow, only positive was that it was so light. We again had Stephan (guide from Verbier) and his wife with us and he was gagging to help Dima cut the track (as he needs to get "guide fit") but Dima was having none of it, though when Dima dug a snow pit on the face we'd later descend Stephan took over. And then on the second ascent (350m) he let Stephan lead as he was probably well fecked. 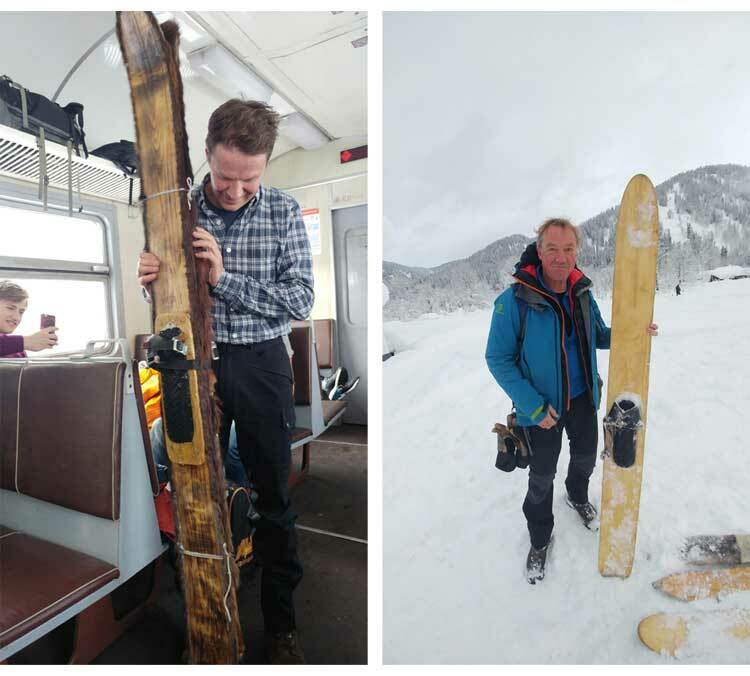 Depth of snow at 550m was 150cm and at peak circa 1020m 190cm. Thought I'd given up on saying that was one of the best days of the year / season / ever but those words sprung to mind and it's great to hear another guide, all be it on holiday say similar, his Mrs was more euphoric! Everyone's skins are holding up with the multi transitions though one guy lost one from under his jacket. I've just been stashing mine in my pack sans issue. Have added a new style of transition to my repertoire standing on the ski I'm not changing (both feet on same ski) so I don't sink up past my knee. Don't know if I've already said it but pace nice and mellow at 300m per hour so as not to break sweat and then get cold. Once back in the valley we skin along the train tracks and there are so many freight trains carrying coal going back and forth ss there are no roads, adds a whole new dimension to skinning and the whole atmosphere. Look forward to the TR on your return. It sounds like the rest of the season could be a bit of an anticlimax for you after this. Is this kind of snow this early usual in Siberia??? Potential new bucket list item!! Presumably it is "warmer" in Nov then Jan!! On our way back now, so do have some internet here at the overnight stop in Abakan. Been a great six days of deep cold smoking powder with a great team. Spent time in Moscow Airport yesterday editing the final vid - I'll get round to more of a TR later. Was a long journey back but feel reasonably refreshed this morning unlike last evening, even though I lost 7 hrs! Suppose I should explain about the soundtrack to the vid, life in Luzhba revolves around the railway, it's the only way people / supplies etc get in and out and most days we skinned alongside the track - the start of the tannoy announcement was always three tones and I deduced that it sounded like the theme from The Saint TV series and then a bit more Googling and I found a "funky" version of the theme tune. The goods train take nigh on 100secs to go pass and are made up of nigh on 70 trucks and are known as the Siberian Snakes. Wow, and it's only November! Skiing looks great, the lodge location is a bit "here's Johnny"
Are you planning to go back to the same place next year? @Weathercam, out of interest, what device/software did you edit the video on? Looked great. 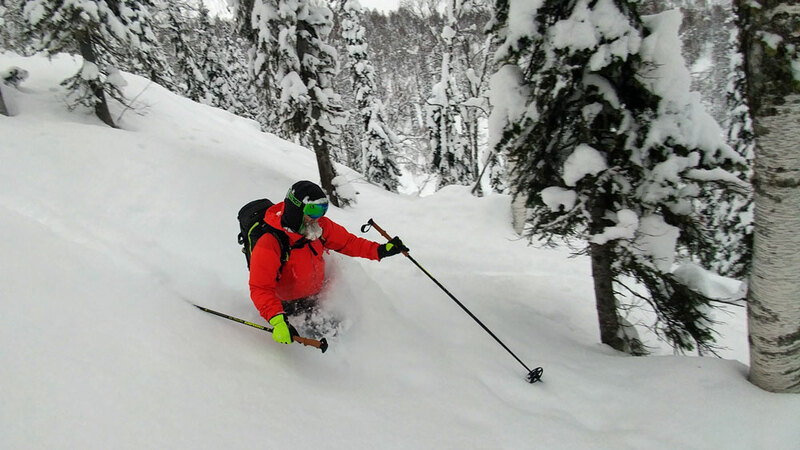 Was it all tree skiing or were there any open faces you could get up onto? Plenty of steep pitches? My word. That looks awesome. Great vid, thanks for sharing. Looks epic! Planning next year? I thought this was a once in a lifetime trip originally. A the start of your music explanation I was expecting the Hi-di-hi theme tune. Terrain and topography looks a lot like Rogers Pass in Interior BC, Canada. Cost breakdown would be much appreciated. Thanks. Looks great! I'd be keen to see a cost breakdown too. Beyond the fact it's all there in November and it's a different experience - what would you say were the selling points over Georgia/Caucuses or, say Lofoten. Presume snow in Lofoten is generally not the same quality. @kitenski, yes this snow is frequently like this - hence their programme starts the week we went. @kitenski, used a mixture of drone, smartphone and obviously GoPro and edited it on Adobe Elements. @galpinos, pretty well all tree skiing but some open faces and steep up high but video not that good as definition not that good in the flat light, and plenty of steep pitches. 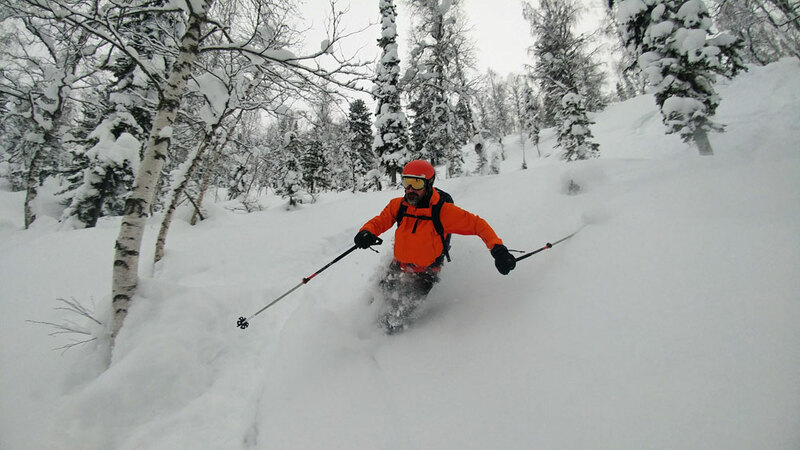 @jedster, I've done five trips to Lyngen over the years and maybe scored powder on a couple of days, majority was spring snow the quality of snow here was on a par with Hokkaido. As for costs think Aeroflot flights were £650 that's London - Moscow - Abakan and baggage checked in all the way - and total cost of lodge and guide was €2,100 and that included all transfers of which there were many and hotel in Abakan on return leg on Saturday. Food was plentiful, solid breakfast, and take as much as you could for lunch, then soup at 16:00 and sauna 17:00 onwards and dinner at 20:00. I'll write up more later about the actual days, but pace was very very slow on the ascents as the idea was not to start sweating and then get cold, so we did about 300m per hour. PS the skiing was pretty awesome all six days (and that's not just video from one day etc), but the whole week and that was confirmed by one of our group a guide from http://www.worldguiding.ch/teammanager Stephanie who traveled there with his wife and skied with our group who said that's quite rare to get such good consistent snow. Looks like a fantastic trip. Very envious. Cheers for the price breakdown. Not unreasonable, but too rich for my blood. Cost me £953 for a 10-day trip (8 days skiing) to Gudauri, Georgia all-in. So if I was going East again I'd do a 14-day trip to Georgia taking in the resorts west of Tbilisi which would come in at around £1400 all-in, around £2000 if guides and/or heli time was involved. @Mike Pow, Mike, what's your flight path been to Tbilisi? On search engines, it appears to be hellish from the US, but sometimes I can hack my way around some inconvenience if willing to roll the dice on 2 separate tickets (e.g., one itinerary to UK and then another from UK to somewhere beyond). Looks good. It was on my list years ago, but they had a few wars and things, from what I remember. A side note - you could maybe crank up the exposure on videos by a fair but - take a look at the luminosity, you're only using about half the dynamic range. Great vids and thread. Thanks for sharing. @Mike Pow, it's taking a long time and it's work in progress as it's turning into a bit of a novel, and I have not even got to the skiing yet! But as a taster from the North Face The Great Siberian Traverse YouTube Video. 21:30 into it they feature these skis, which I have to admit to thinking it was all of a bit of setup but as you can see we did come across them more than once! Work in progress on the link in my signature. Looks like it’s still delivering! @BobinCH, that looks colder than when we were there judging by the way they're dressed, though difficult to tell but certainly looks like fresh snow. I've now finished off the features - the first one is more about the preparation for the trip. And the second is more of a travel report. along with some detailed images of the various sectors. Yesterday Per the guide was round and I've told him I'll be up for the same trip next year though OH afterwards has made it very clear that "she" wants to do Japan again in 2020 with the guide we met this year, so will have my work cut out me thinks. Finally, someone found where these crazy train station sounds come from. Thanks to Gavin Baylis for research and this fancy movie! This is the final video of our great trip to Siberia. Suppose I should explain about the soundtrack to the video. Life in Luzhba revolves around the railway, it's the only way people / supplies etc get in and out and most days we skinned alongside the track. The start of the tannoy announcement was always three distinct tones and I deduced that it sounded like the theme from The Saint TV series and then a bit more Googling and I found the chords.